The plan was to publish this pattern at the beginning of December; a perfect last minute gift that used scraps of yarn – then the website went wrong. Really, really wrong. It’s now January and you have my respect if you’re already planning your Christmas gifts but these are still an ideal pair of mittens. Named after the Sussex town of Lewes where Nicola and I go to do our Christmas shopping or where Nicola shops and I dither as I can never make a decision. You can use mini skeins or scraps of 4ply yarn and have as many or as few colours as you like – the choice is yours. They are worked in the round on DPNs but can easily be adapted for magic loop if you prefer. Beginning with a multicoloured ribbing and then a very simple three stitch, slip stitch pattern. Easy to size up or down by adding or subtracting stitches in multiples of three. We’ve made them in both our BFL Smooth Sock and Slubby Sock yarns. 19 cm circumference, un-stretched across the palm and 21 cm long in sock yarn. Or 45g of sock weight yarn. 18 sts x 24 rounds to 5cm over slip stitch pattern after washing and blocking. The pattern is a simple three stitch repeat. To increase or reduce the size simply add or subtract stitches in a multiple of three. To make the cuff longer or shorter add or subtract multiples of the six round pattern before you knit the waste yarn for the thumb. For a two-coloured mitt change the colour of the working yarn every three rounds of the main pattern. After the thumb section work a further 30 rounds to balance the pattern before the i-cord cast-off. 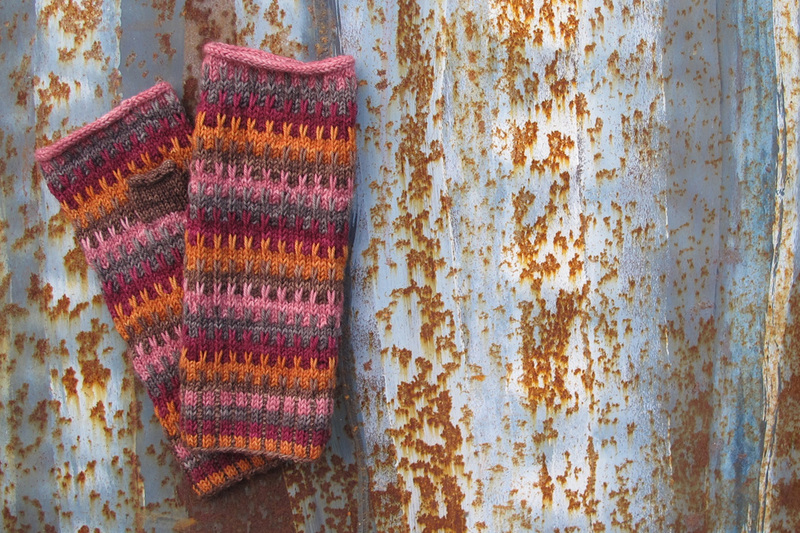 ssk: slip, slip, knit. Slip the next two stitches knitwise, one at a time, return to the LH needle in their new orientation and k together through back loops. Keeping the yarn not in use at the WS of the work continue as follows. R 1: * Using C1 p1, using C2 k2; rep from * to end. R 2-3: Rep round 1. R 4: * Using C1 p1, using C3 k2; rep from * until end. R 5-6: Rep round 4. R 7: * Using C1 p1, using C4 k2; rep from * until end. R 8-9: Rep round 7. R 10: * Using C1 p1, using C5 k2; rep from * until end. R 11-12: Rep round 10. R 1-3: With C1 knit. R 4-6: With C2, * sl1, k2; rep from * to end. R 7-9: With C2 knit. R 10-12: With C3, * sl1, k2; rep from * to end.R 13-15: With C3 knit. R 16-18: With C4, * sl1, k2; rep from * to end.R 19-21: With C4 knit. R 22-24: With C5, * sl1, k2; rep from * to end.R 25-27: With C5 knit. R 28-30: With C1, * sl1, k2; rep from * to end. R 56: With waste yarn k10, return the 10 sts just knit back to the left hand needle. With C5 k to end. R 57: with C5 knit. Continue in pattern as set for a further 27 rounds changing colours as required. With C5 cast on 3 sts using the cable method. *K2, ssk (the third st of those you just cast on and the first st from the main work). Slip 3 sts purl-wise from right to left needle; rep from * to last three sts. Using 2.25mm needles, pick up the right leg or side of the 10 C5 stitches directly under the waste yarn. Using another 2.25mm needle repeat for the 10 C5 stitches directly above the waste yarn. You now have two needles with 10 stitches each. Carefully remove the waste yarn ensuring all stitches are safely on the needles. Using yarn C1 knit across the stitches on needle 1 Pick up and knit 1 stitch from the side of the thumbhole. Knit across the 10 stitches on needle 2 pick up and knit 1 stitch from the side of the thumbhole. 22sts. Arrange the stitches over three needles and join in the round. With C1 repeat the i-cord cast-off as for the top of the mitten. Block the two mittens with one thumb aligned for left hand and one for the right.